Albany, is an essential piece of the City’s urban fabric and a significant connection to its most scenic natural resource, the Hudson River. 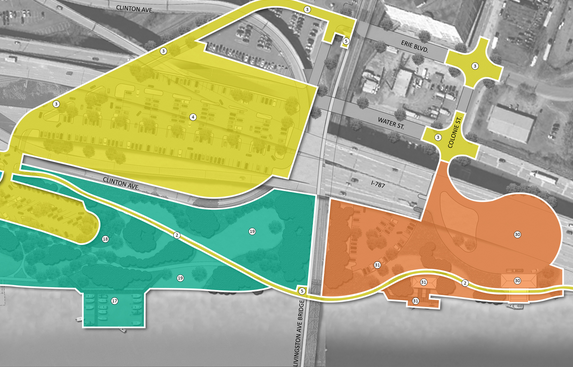 Although the preserve is a draw, public access is primarily limited to a single pedestrian bridge over 787, an indirect route from the warehouse district, or to those travelling by car along Quay Street. Connectivity to the Corning Preserve is highly disrupted by twelve lanes of moving traffic (including Interstate-787 and its frontage roads), and a freight rail line nestled within the highway corridor. Albany’s Department of Development and Planning, along with the Corning Preserve Steering Committee and a team of consultants, including a representative of LABC, have working together to create the Corning Preserve Master Plan a collective endeavor to outline existing amenities and prioritize future improvements. Read more about this plan and it’s recommendations here. The Coalition is excited that the plan will drive investment to the Gateway areas of the Preserve – particularly at the base of the Bridge. Connecting the Bridge’s walkway is a major tenant of the program narrative. Preserve Master Plan, but big-ticket, long-term game changing efforts like removal of 787, creating a destination waterfront residential and commercial hub, and enhancing access all along the Albany and Rensselaer waterfronts. At last night’s ROW meeting we discussed a small marina planned for Broadway in Albany, the proposed Casino development on Rensselaer’s waterfront, the potential Livingston Ave. Bridge walkway, and future connection opportunities. We were pleased to see the City of Rensselaer looking at connecting to the waterfront not only to the south (LABC is not weighing in on the proposed Casino, a promenade and/or trail on the side will be a plus) but to the north as well. 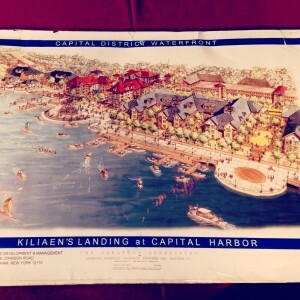 Killian’s Landing, named for Kiliaen van Rensselaer, a Dutch merchant who was one of the founders and directors of the Dutch West India Company, is a currently a series of small parcels previously identified as an ideal redevelopment area for a mixed-use development. The City created a Master Plan and has been attempting to attract a developer. 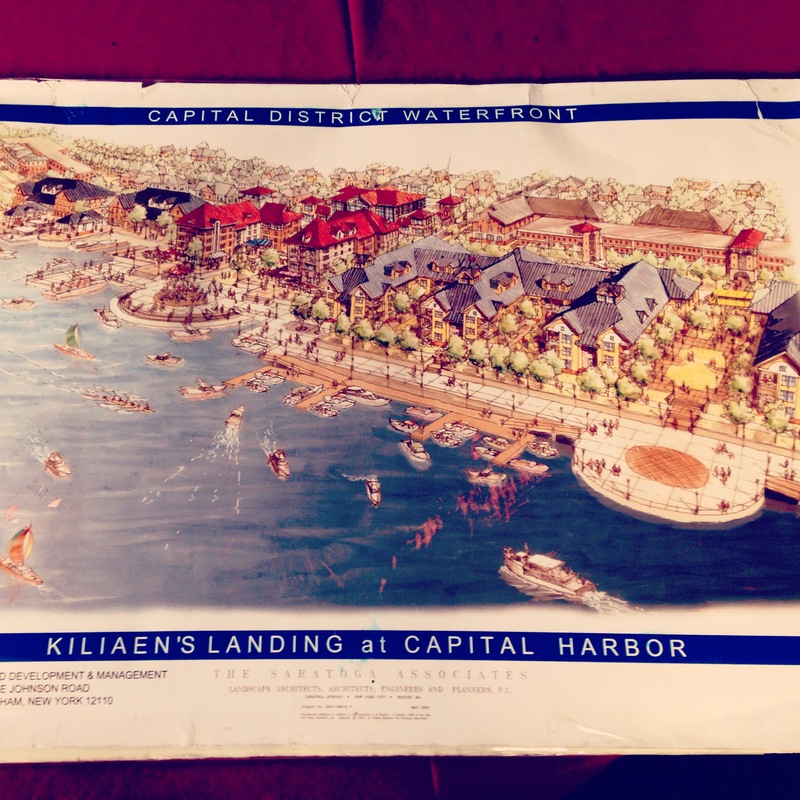 (Read more about the waterfront plan here). if developed, this area could provide an extension of the the proposes Riverfront trail and expansion of the Forbes Avenue Boat Launch for public water access. After looking at the renderings, there’s a clear preferred alternative and no offense of the folks at BFJ, but Saratoga Associates rendering is a million times more attractive. While Albany’s waterfront is cut off from the rest of the city, and programmed for recreational and industrial use, Rensselaer has a great opportunity to develop their waterfront. Proposed mixed use development on the east, proposed cultural and recreational enhancements on the west – but how to connect them? I think you know where I’m going with this. All this is great – but it doesn’t set into motion the actual connection – We still must rely on State DOT, Federal Highways, Amtrak, and CSX to respect the needs and desires of the community. Albany and Rensselaer both support the walkway – our state, federal, and private partners that hold the future of the Walkway in the palm of their hands must realize the benefits of working with the community.